Desirable Lakewood home tastefully updated preserving so much of it's original character you can not find anymore. Gorgeous beveled and stained glass windows, original hardwood floors, doors to sunroom are from the Sly Mansion that were rescued from the Historical Society, original wood beams, original wood work throughout the first floor. The first floor also has a wood burning fireplace with original built ins. Newly remodeled kitchen 2017 mostly new cabinets, kept some original charming uppers. Gorgeous Bianco Antico granite counters. Hand made leaded glass doors on cabinets, new light fixtures and has a swinging door to large dining room. What else you will love about this home is the back sun room and all the sunshine that comes in the windows, custom blinds let you determine how much sunlight. Or enjoy the cozy 3 season front porch. 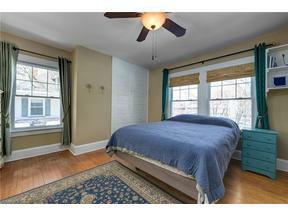 If that is not enough this home has 4b with original hardwood floors great windows. Updated bath with new tub/shower. Finished 3rd floor that has 2 rooms and a walk in closet. The basement is mostly finished and has an original kitchen and a shower. This home sits on a nice sized lot with lots of possibilities in the back yard. You do not see homes like this anymore! Move in and enjoy all the character and history this home has to offer.